Step into the shoes of the skillful agent codenamed Solid Snake and infiltrate a heavily defended facility in this top-down action game - Metal Gear! Metal Gear is an overhead military action shooting adventure and stealth video game that was originally released back in 1987 for the MSX2 computer. In this game, the player must navigate through hostile territory while trying to remain undetected by avoiding visual contact and direct confrontation. If the player is discovered, the enemies will be alerted and will try to shoot or capture Solid Snake, in which case, the player must try his/her best to escape and resume sneaking in after some time has passed. 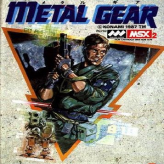 Metal Gear is an online MSX game that you can play at Emulator Online. This free MSX game is the United States of America region version for the USA. Metal Gear is a single title from the many arcade games, adventure games and metal gear games offered for this console. If you enjoyed playing this, then you can find similar games in the msx games category. Metal Gear game is from the various retro games on the site, and there are more games like this, including Metal Slug, Metal Gear Solid and Metal Sonic Rebooted.